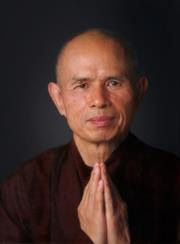 Dear Friends, Here is a message from a dear Dharma Teacher, Chan Phap Tri. one and all. It is truly wonderful to be part of a community of practice that is based so much on the Heart. I know one of my favorite recitations from the Chanting of the Heart chanting book is “Awakening the Source of Love” which starts on p. 75. I have attached a copy of it for those of you who may not have a chanting book. cleansing my mind from all impurities. Namo Avalokiteshvara, I vow to look deeply into the Five Skandhas. I vow to see the true nature of emptiness. I vow soon to reach the shore of awakening. I vow to overcome all obstacles. I vow to take the boat of Perfect Understanding. Namo Avalokiteshvara, I vow to be present in all three bodies. I vow to realize the fruits of liberation. I vow to cultivate great compassion. I vow to understand deeply the Tathagata Store. I vow to purify my mind. Namo Avalokiteshvara, please help me get out of the abyss of craving. Please help me dissolve the worries of my mind. Please give me skillful means. Please help me build Sangha. Please help me transform my anger and hatred. Please help me uproot my ignorance. Please help me hold the high torch of right faith. Please give me the clear eyes of understanding. Namo Avalokiteshvara, please place in my hand the golden lotus. Please allow me to see the Dharma Body. I vow to build brotherhood and sisterhood. I vow to show gratitude to my spiritual lineage. I vow to practice loving speech. I vow to look with loving eyes. I vow to live mindfully and with clarity. I vow to realize meditative concentration. I vow to walk mindfully night and day. I vow to abide peacefully in the ground of reality. I vow to cultivate the five kinds of eyes, and the six miraculous powers. to stop the killing and bombing. bringing compassionate nectar and medicine. Please walk with me to the realm of the hungry ghosts. in order to cool the heat of afflictions. and help the source of love to flow again.